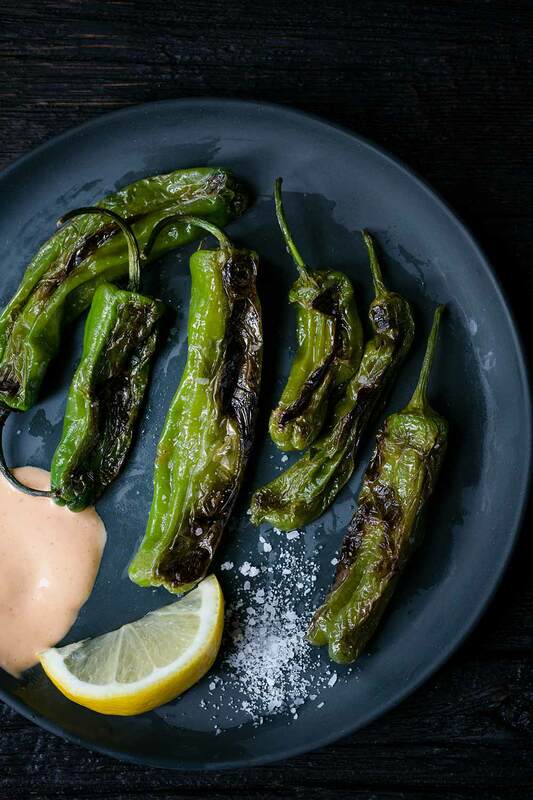 Blistered Shishito Peppers are the perfect appetizer; they’re delicate and mild, with a hint of sweetness and heat. They come together quickly on the stovetop and are wonderful with a squeeze of fresh lemon and a pinch of salt. For even more flavor, try dipping them into this quick and easy Sriracha aioli! Last weekend I visited one of my favorite local vacation spots: Dewey & Rehoboth Beach on Maryland’s eastern shore. We have an amazing place to stay toward the end of Dewey, away from the main drag that tends to be a bit more of a bar scene than I prefer. Dewey is a 10 minute drive from Reboboth, which is full of restaurants that serve local seafood. While waiting for our dinner table on Saturday evening, we stopped at a nearby bar for drinks and appetizers. Can you guess what stood out? I couldn’t get enough of their blistered shishito peppers, which go so well with icy cold beer. I had to have more of these peppers as soon as I got home. They’re incredibly quick and easy to prepare, and taste great with fresh lemon juice and a pinch of salt. However, I also love them with homemade aioli. Heat a thin layer of extra virgin olive oil (or any neutral-flavored oil with a high smoke point) in a large sauté pan, preferably cast iron (larger than the pan used in the photo above; see the last photo in this post). You want the skillet to be very hot but not smoking. When they’re ready, toss with a bit of kosher or sea salt and add a squeeze of fresh lemon juice. Serve hot on their own or with a dipping sauce. 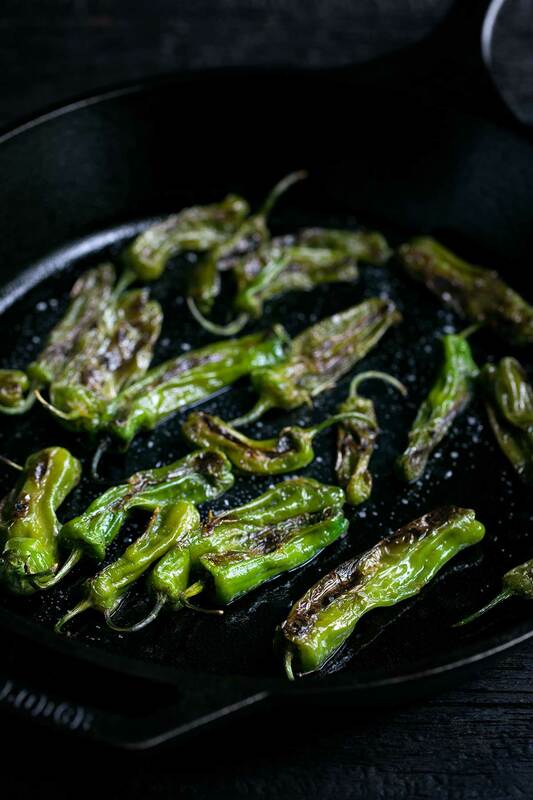 You can eat the entire pepper except for the stem (which you can grab them by, making these perfect finger food). Shishito peppers can typically be found in grocery stores and farmers markets from summer through fall (obviously this might vary depending on your location), but if you live near an Asian grocery store, you can often fine them year-round. 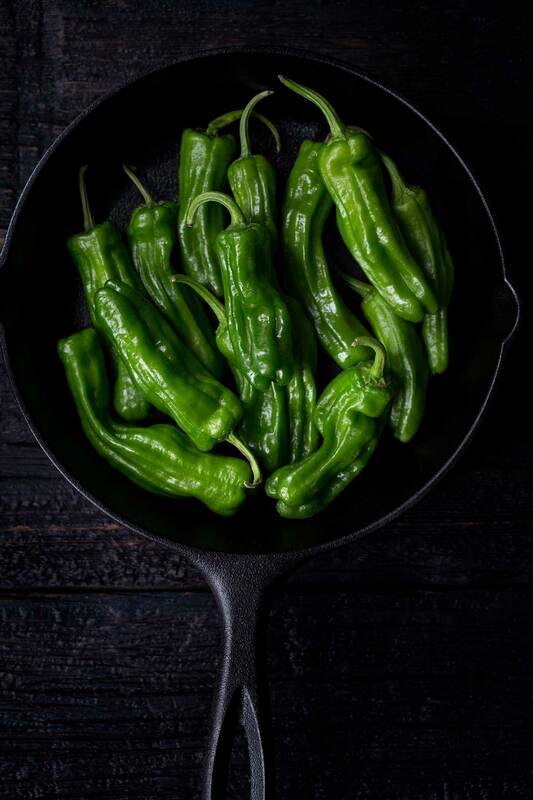 Look for firm, bright green peppers that are between two to five inches long. Store peppers in the crisper drawer of your refrigerator. If they look fresh when you purchase them, they should be fine for several days. Check out my Buffalo Chicken Dip, Baked Gouda in Puff Pastry, and Old Bay Deviled Eggs! I also love these Greek Style Potato Skins with Hummus from A Beautiful Plate. 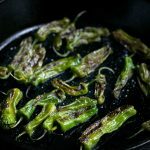 Blistered shishito peppers are a quick and easy appetizer; they're delicate and mild, with a hint of sweetness and spice. For even more flavor, try dipping them in this easy Sriracha aioli! In a small bowl, whisk together the mayonnaise, Sriracha, lemon juice, and garlic. Taste; add a pinch of salt if desired. Heat enough olive oil to coat the bottom of a large sauté pan, preferably cast iron, over medium-high heat until it’s shimmering (very hot) but not smoking. 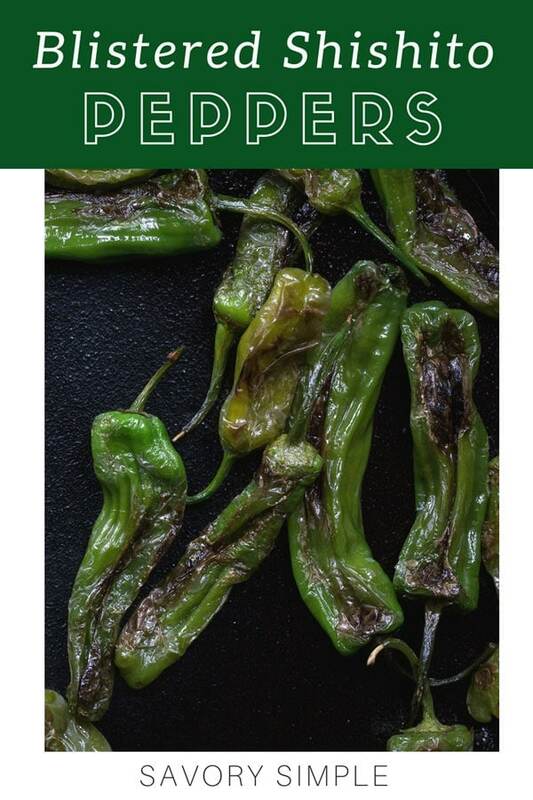 Using kitchen tongs, add the peppers in a single layer and reduce the heat to medium. 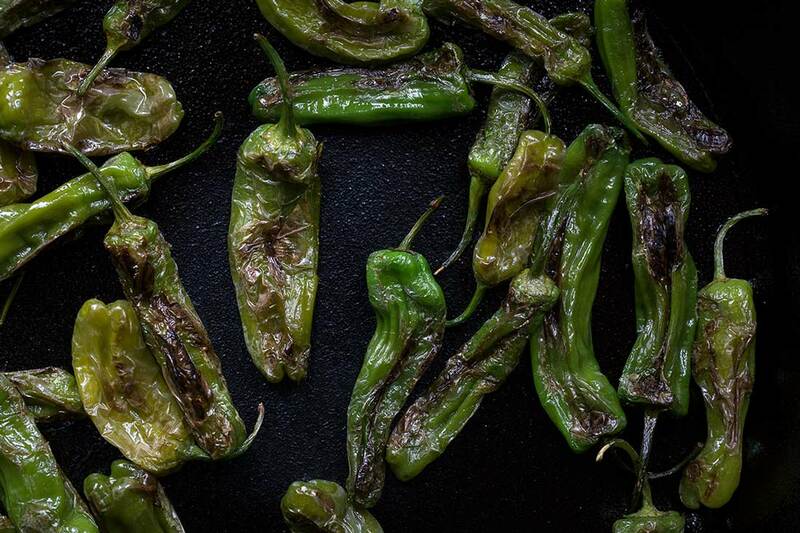 Cook until blistered and wilted, turning frequently so that each pepper chars in a few places but not all over. This will create a flavor that’s smokey as opposed to burnt. You can cook them until they still have a bit of crunch, around 6-7 minutes total, or until they’ve wilted completely, which can take up to 15 minutes (I prefer them completely wilted with a bit more char). To properly infuse the sauce with garlic flavor, I recommend using a microplane zester. This releases the juices and turns the garlic into a paste. Rehoboth Beach is one of my very favorite vacations! Now I want to go back. These peppers sound amazing! So simple yet different – I love that. And that aioli is the perfect compliment!